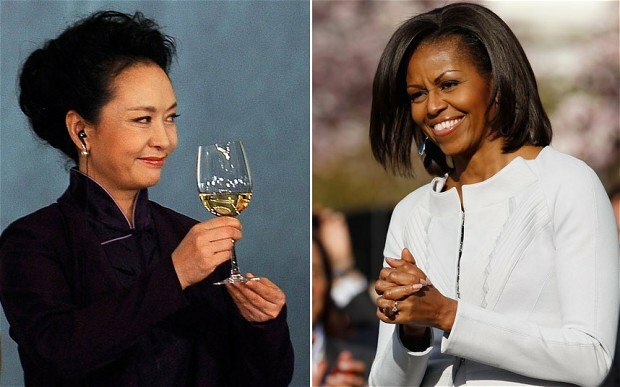 Michelle Obama snubbed China’s First Lady Peng Liyuan after she announced that she would not be attending the summit with the Chinese leading couple when they meet with President Barack Obama. Chinese President Xi Jinping and his wife Peng Liyuan are on a tour of the Americas, which is capped off with a meeting with President Barack Obama in California before they head back to China. Peng Liyuan, however, will likely be making very few public appearances because Michelle Obama opted out of attending, saying that she needs to be in Washington as her daughters finish up the school year. The move comes as a slight in the eyes of the Chinese, who are reportedly big fans of Michelle Obama and feel her presence would have given more significance to the visit. Cheng Li, a Chinese policy expert at the Washington-based Brookings Institute, told The New York Times that Michelle Obama’s decision to stay at home will leave the Chinese “disappointed”. Part of that comes as the US and China are at odds on a number of issues over accusations of cyber-hacking, disputes over intellectual property and mounting regional tensions over North Korea and the South China Sea. As a result of the tense relationship, the meeting is being held in California at Sunnylands, a sprawling desert estate built by billionaire philanthropists Walter and Leonore Annenberg is a place where political powerbrokers once discussed critical issues of the day and where royalty – real and Hollywood – soaked up sun and golfed on a private, nine-hole course. Even though it was meant as a cushioning factor, the location selection apparently backfired by preventing Michelle Obama from attending. “First lady diplomacy is also very important and the US side has failed to cooperate,” Chinese political scientist Zhang Ming told The Telegraph. More than one expert has called for Michelle Obama to provide more of an explanation- and justification- for missing the meeting aside from just pointing to her duties as self-proclaimed “Mom-in-Chief”. Aside from the slight from the Americans, Chinese First Lady Peng Liyuan has received seemingly glowing reviews from the other world leaders that she met during her tour of Trinidad and Tobago, Mexico and Costa Rica. “She’s a very beautiful person, very warm, and to chat with her in English was very wonderful,” said Kamla Persad-Bissessar, the prime minister of Trinidad and Tobago. Though this visit gained her a wider international audience, Peng Liyuan is used to greeting screaming throngs of crowds. Prior to her 1987 marriage to the man who is now the Chinese president, Peng Liyuan made a name for herself as a folk singer. Her music is very popular in the country and she spent years performing for the state’s military during her youth. Peng Liyuan also regularly appears on a broadcast New Year’s program .